Lab Supply has a huge selection of personal protective equipment including surgical sleeves. These disposable sleeves work great for laboratory facilities because they are efficient and cost effective. We offer 18″ elastic wrist and elbow sleeves. 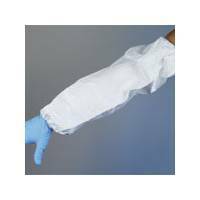 Theses sleeves from Life Science Products are non-woven to eliminate the possibility of liquid contaminating the workers through holes in the woven fibers. In every lab, safety should be a top priority. Personal protective equipment from Life Science Products has been proven to work in a number of animal facilities. If you are interested in the surgical sleeves that we offer, then please click here to view the product in our online store. Here at Lab Supply, we are committed to making sure you find exactly what you are looking for. If you have any questions about these surgical sleeves, then please click here to visit our contact page. We will be more than happy to answer any questions you may have.